The 13 year old has been taking archery for a year, and we get supplies at an archery shop much closer to the stables than home. I was there last Friday, picking up arrows, and joined in a conversation about deer season. Somehow the conversation ended with the shop proprietor asking me if I'd like some venison. I said, "If some venison fell into my lap, I wouldn't say 'no.'" 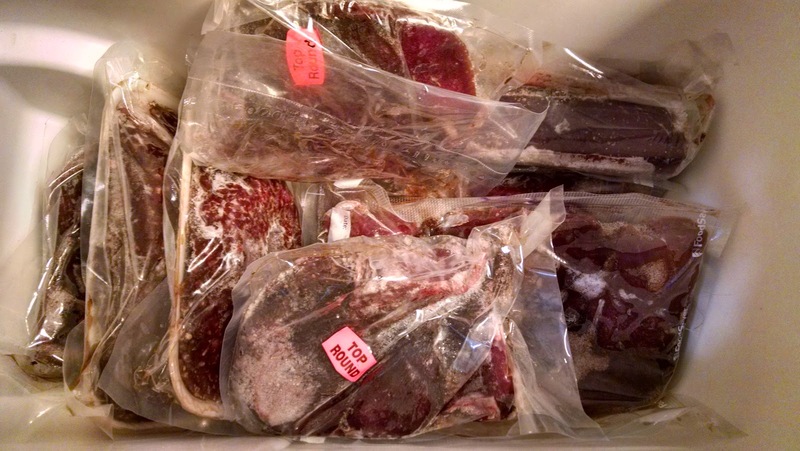 So he offered to bring me some, I offered to pay for it, and he said he'd just give it to me since he had to empty out his freezer in time for this season. Well, I wasn't one to take something without at least some compensation, so the next day I went back with a cooler and some jars of preserves: strawberry jam, hot pepper sauce, and eggplant caponata. Unfortunately, he'd forgotten his cooler! We made arrangements for me to stop by today and the venison is now in my possession. I've never cooked venison before so this will be an interesting experiment! Thus far, there has been a request for a pie, with which I shall try to comply. I'm also in the middle of a jam for eggs barter as well with a woman who works with my husband. He brought her a jar of jam from me (raspberry) and, when her hens cooperate, a dozen eggs will be coming our way. I would suggest very slow roasting at low temps, I used to do mine at about 125 overnite. Makes it very tender. Garlic is excellent with it in case it is too gamy tasting. The favorite dish I made was Venison pie, just like a chicken pot pie, only with venison in either small chunks or ground. Makes my mouth water just thinking about it. Do you have a favorite recipe for the pie?